State Budget Town Hall and Budget hearings concerning education, children to be held March 25 and April 2 in Flagstaff. Arizona’s House Democrats are traveling around the state to find out what YOU would like to see in our state budget. I spoke with Rep. Wenona Bennally (LD 7) this week. She plans to attend, according to Tricia Roach, Chair AEA-Retired, Flagstaff Chapter. The meeting will be held at 12:30 p.m. Saturday, March 25 at Flagstaff City Hall, 211 W. Aspen Ave., Flagstaff. 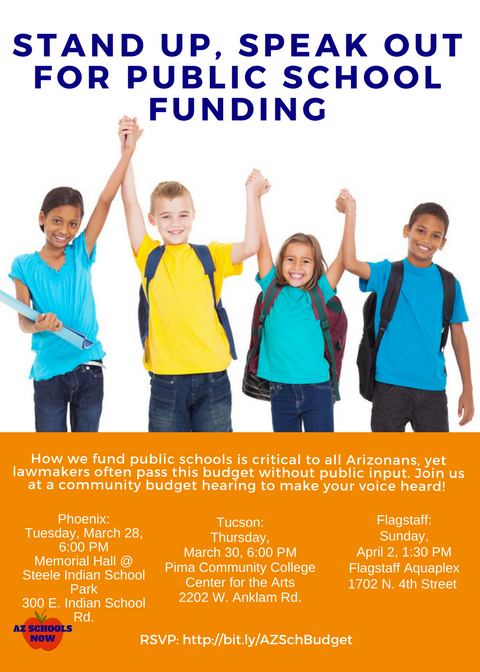 Arizona Schools Now is hosting a community budget hearing to let everyday Arizonans weigh in on education funding at 1:30 p.m. Sunday, April 2 at The Flagstaff Aquaplex, 1702 N. Fourth St., Flagstaff. Children’s Action Alliance — How Are Kids Doing in Your Legislative District?